Improve organization, appearance and productivity. Helps eliminate HAIs and cross-contamination. 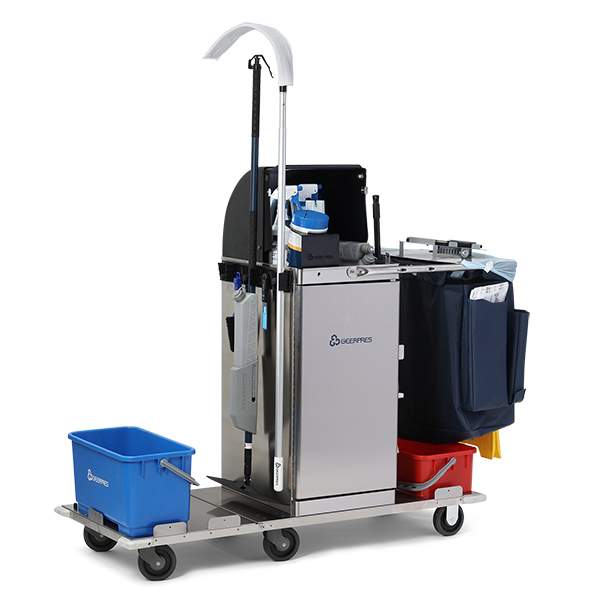 Modular design including adjustable handles, bags, bucket configurations, and accessory components to meet virtually any protocol and product(s). Maintain an organized, attractive exterior and work with limited requirements to unlock the main cabinet door. Available in durable, corrosion-resistant stainless steel or powder-coated finishes. 10-year warranty on stainless steel models. 5-year warranty on powder-coated models. 6.2 cubic feet of lockable main cabinet storage space. Magnetized door(s) keep the door(s) closed, even while unlocked. Three front tray options for various mop and bucket configurations: 6″ base, 12″ or 18″ flip-up trays with secure locking for reduced storage space. Optional Space Station® Cart-top Console with see-through window and lockable storage. Non-marking bumpers and four (standard) or six (with add-on, flip-up tray), 5″ quiet casters. Standard, unbreakable Geer-Key® locking system or optional E-Key®. Standard 25-gallon trash bag with C-zipper and multiple pockets. Dry Dock two-shelf storage bag option (5 cubic feet of storage) available. Multiple Gripit® bars, with four handle holders and four hook holders. Repositioning handle adapts for varying configurations. Includes a Glove Box, Sanitizer Holder, and Double Floor Sign Holder. Compatible with Advantex® single-use products (disposable wipes, mops, and more). Virtual Manager software tablet holder (improve EVS outcomes and productivity).